Tell tech firms: Don't help Trump build a Muslim registry! Last month, top tech corporations: Facebook, Twitter, Microsoft, Google, Apple, IBM, Booz Allen Hamilton, SRA International, and CGI were all asked if they’d sell their technology to help Trump build a Muslim registry - an insidious plan to track, racially profile, and relegate Muslim Americans to second-class citizenship. Nearly all of these companies were silent and refused to answer. Trump is already showing us that his administration will put our communities, freedoms, families, in danger -- and it’s time for tech companies to take a stand and refuse to create a Muslim registry. The only company to unequivocally state that they will not help Trump harm our communities was Twitter. And it was only under pressure from Color Of Change, and other organizations like CREDO, that Facebook, Microsoft, Apple, and Google agreed not to help build the registry. The refusal of the other four tech giants begs the question. If these companies are willing to make money off Muslim users, why aren’t they willing to protect them? 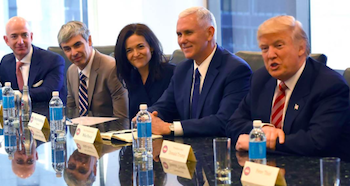 These firms have become wildly successful because of diverse users like us and now, they’re open to sell-out their base to gain favor with Trump’s administration of hate. That’s why we’re demanding that tech companies pick a side and reject Trump’s Muslim registry. It is the duty of these firms to refuse to target users on the basis of race, religion, or nationality. If they don’t, they are rejecting inclusion and choosing fear. Tell tech firms to take a stand against Trump's Muslim registry now. Demand that CEOs at Microsoft, Google, Apple, IBM, Booz Allen Hamilton, SRA International, and CGI refuse to build a Muslim registry.